PJ Snyder currently receives services through DDRC. PJ has Angelman Syndrome, a neuro-genetic disorder that causes daily issues from being non-verbal, seizures, and severe scoliosis and balance issues requiring a wheelchair for mobility. Yet, PJ has a contagious happy disposition, loves music and water, and lives an active life out in the community. Since 2012, PJ has participated in almost 60 events with Athletes in Tandem (AiT) including the Boulder Ironman in 2014. AiT was created for athletes to partner in swimming, cycling, running, and triathlon events with individuals of all abilities. AiT promotes an active lifestyle for individuals to increase the quality of their lives and become part of the community of outdoor recreational enthusiasts. 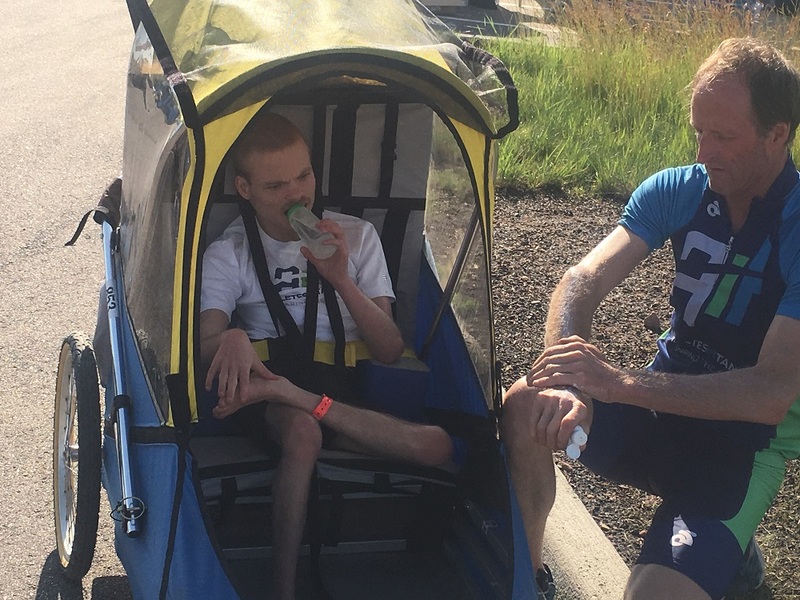 They use their athletic skills and knowledge of endurance training and racing, combined with adaptive equipment, to compete together in mainstream swimming, cycling, running and triathlon events. Their goal is to provide a path for anyone, regardless of physical ability, to participate in outdoor events; from 5Ks to marathons and Sprint distance to Ironman distance triathlons. On July 17, PJ Snyder and AiT founder Dennis Vanderheiden, embarked on an epic adventure, bicycling 600 miles in 13 days from Four Corners, CO through some of the Colorado’s most scenic and mountainous areas ending in Golden, CO. The ride, named "Four Corners to a Home," was done to raise money for an eventual home for Snyder, who turned 31 during the ride, where he can live out his life, as well as raising awareness and research funding for Angelman Syndrome. "He loves to be outdoors, and he loves the attention," said Cindy Snyder, PJ’s adoptive mother. PJ sat next to her in his wheelchair. Although rendered nonverbal by the disease, he smiled and held the celebratory balloons that helped greet him at the end of the ride. The two of them live in an apartment in the Edgewater/Wheat Ridge area. They decided to end the ride in Golden, because the Golden or Wheat Ridge area would be where she would love to see the two of them find a permanent home. "Everything went well," said Vanderheiden, munching on pizza between interview answers. A multi-sport athlete from Ft. Collins, Vanderheiden has participated in more than 70 bike and running events with PJ over the years, including a full Ironman triathlon. Even with pulling an additional 100 pounds of weight behind his bike for 13 days, over uphill climbs the likes of Monarch Pass and Trail Ridge Road, Vandenheider said his toughest challenges were largely mental. "We made our destination on the first day, found some shade and I just collapsed there and thought, I don’t know if I can do this,’ " Vanderheiden recalled. But partnered with the Snyders for support, and with a documentary film crew along for the ride, Vanderheiden said he knew he had to find a way. The documentary, which Vanderheiden said will include interviews with doctors and Angelman Syndrome patients across the country, is not expected to be finished for a year. In the meantime, Snyder and Vanderheiden still have quite a few events on their calendar for the rest of the year. We inherently want to help people, go do it, because the rewards are great. Visit www.fourcornerstoahome.com for more updates on PJ’s story.